Ernests Gulbis made a return appearance in the final at the International Tennis Championships in Delray Beach, Florida. The 2010 champion battled 29 year old Edouard Roger-Vasselin who was in his maiden ATP final. Gulbis downed Roger-Vasselin 7-6, 6-3 to bank his third career trophy. This is the first time since 2007 in Houston that two players ranked outside the top hundred have reached this stage of the tournament. Gulbis, a former top 30 player, narrowly escaped the qualifying round to get into the main draw. In the second round, Gublis overcame a 4-0 lead by third seed Sam Querrey in the third set. Later, in the semifinals versus second seed Tommy Haas, the Latvian erased a 0-40 disadvantage in the third set at 5 all to become the sixth qualifier to advance to the final. For his part, Roger-Vasselin bounced big serving Ivo Karlovic in the second round, then, shocked top seed John Isner in the semifinals. Although Gulbis and Roger-Vasselin had not met at the big league level, the two clashed on three prior occasions on the challenger circuit last in 2007 with Gulbis the winner every time. Subsequent to Gulbis capturing a 2-0 lead, Roger-Vasselin bounced back with a forehand volley winner to get back on serve in the opening set. Following a love hold for 4 all, Roger-Vasselin was gifted a double fault by his opponent to arrive at break point. With a forehand crosscourt winner, Gulbis dismissed his mistake for deuce. However, after committing a backhand miscue to hand his rival a break point, Gulbis double faulted to donate a 5-4 advantage to Roger-Vasselin. After wiping out double break point and failing to convert on a set point, the Frenchman netted a forehand to face another break point. With Roger-Vasselin slicing a backhand into the net, Gublis equalized the set. Soon, a tiebreaker was called upon. With a forehand crosscourt winner, Gulbis grabbed a mini-break then raced to a 4-1 edge. The Latvian eventually took the tiebreaker 7-3. Both competitors began the second set strongly. But, in the seventh game, Gulbis made his move. By forcing a double fault from Roger-Vasselin, the Latvian manufactured double break point. Promptly, with a dropshot winner, Gulbis pocketed the break for 4-3. With a quick hold, Gulbis consolidated for 5-3. After, Roger-Vasselin allowed a 40-15 lead to evaporate, he misfired on backhand down the line to give Gulbis championship point. When a second successive backhand by the Frenchman missed its mark, Gulbis sealed the victory and became the third qualifier to triumph in Delray Beach. 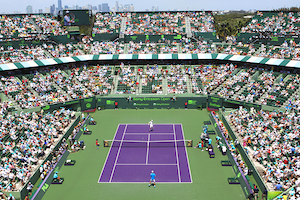 Roger-Vasselin had a career week in South Florida. Not only was this his initial ATP final, it was his first career ATP quarterfinal. Moreover, from position 105, the Frenchman will climb to a ranking around 79, a few spot below his career high of 67 in June 2012. 24 year Gulbis now has a 3-0 record in finals and will see his ranking catapult to around 52 from 109 on Monday.